Originally, the award for the best high school football player in the Kansas City metropolitan area was the D.M. Nigro Award. The award was given annually from 1931 until 1975 (the year of D.M. Nigro's death). Following Nigro's death, no top player award was handed out from the years of 1975 to 1982. In April of 1983, Tommy Simone, a 12 year old from the Northland was stuck and killed by a police car that was responding to a distress call. Tommy was known an ultimate competitor, and his death left the community in shock. To honor Tommy, his parents came up with the idea of reinstating the annual award for the best high school football player in Kansas City, hence the arrival of the Simone Award. The Simone Award has been given annually since 1983. The final verdict on the winner of the award is made up of votes casted by members of the Greater Kansas City Coaches Football Association and select members of the local media. By maintaing the elite prestigous of the Simone Award on a yearly basis, the memory of Tommy Simone has been enshrined in Kansas City history. Perhaps the more recent and most intriguing of the winners include NFL players the likes of Ladell Betts (1996), Darren Sproles (2000), Chase Coffman (2004), and Josh Freeman (2006). But the most interesting thing about many of the winners that haven't gone on to the NFL is the lives they lead after their Simone days, that don't necessarily involve the stardom they received in high school. Josh Brewer (1997) and Michael Keenan (2003) went on to join the Armed Forces after deciding that serving their country was of the very high importance in their lives. Some, like Jason Thoren (1993) have decided the coaching route is the best option (Thoren serves as the defensive coordinator at Baker University). 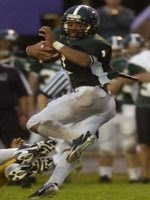 Others, like Arland Bruce (1995) have even headed North of the border to reach their peak (Bruce stars in the Canadian Football League for the Toronto Arganauts). Can Abenoja joins the likes of past past Blue Valley Simone winners Andy Murray (1991) and Zach Rampy (2006)? 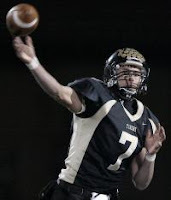 That is the one of the bigger questions facing Abenoja as he enters his third year as the starting quarterback for the Blue Valley Tigers, one of the more prestigious football programs in the state. Abenoja led Blue Valley to the 6A Sub-State game last season, where they fell to Lawrence Free State 14-7. Abenoja played his worst game of the season against Free State, and likely that failure will drive him to have an excellent senior season with few let downs. With good size (6'2" 190) and a great offense to run, Abenoja will have an explosive senior season. 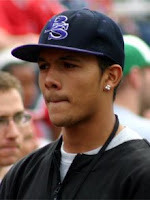 The last Belfonte that was in position to win a Simone was Sal's older brother, DJ, who graduated in 2006. DJ was Mr. Everything on the football field for Rockhurst and looked primed to win the Simone until a devastating season ending injury took him out of play during the 2005 season. It is now Sal's turn at the award. After losing leaders Nathan Scheelhaase and Keith Langtry to graduation, the eyes of everyone on the Rockhurst roster will be on Belftonte. I'm guessing he will be up for the challenge. Belfonte is an explosive player (4.5 forty) with a physicallity that you usually don't see in anyone weighing under 300 pounds. Belfonte will receive as much exposure as any of the players on this short list, due to that fact that he plays for Rockhurst, arguably the most prestigious high school football school in KC. Camren Torneden is the most explosive football player I have seen in the Sunflower Conference since Darren Sproles. There, I said it. Not buying it? Check out Torneden's highlights here. Might I add, if Torneden was 6 foot tall (as opposed to 5'7") he would be getting as much D1 attention as anyone in the state. He is just that explosive...but his height is what seems to be scaring the D1 colleges away from giving him offers. I fully expect Torneden to be as elusive and dominant as he was last season (1,362 rushing yards and 1,042 passing yards in 11 starts). Torneden will put up the numbers, its just a matter of whether or not Lawrence Free State does well enough for him to receive alot of attention locally in the KC Metro. Keep in mind, only one player from the city has even won the Simone Award, and that was Jason Thoren of Lawrence High School in 1994. Justin McCay has gained ALOT of attention in just this past off-season. Offers from big time schools the likes of Florida, Notre Dame, Oklahoma, Florida State, Georgia, among others, will do that. 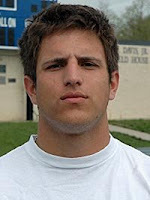 McCay is currently ranked by Rivals.com as the 31st best player in the nation for the Class of 2010. The KC Metro has not had a player ranked as highly as McCay in years. For those very reasons, McCay will have a microscope on him the size of Johnson County. Every game of his will be analyzed by critics, scouts, and the media. If he performs well, everything will be gravy for the 6'3" 200 pound stud. If he doesn't put up the biggest numbers, the critcs will be out in droves...but, I tend to think McCay will have a pretty dominant senior season--and I feel he will outperform his numbers of last year. Terry may by the Darkhorse in the running for the Simone, but that doesn't mean he doesn't have the credentials to potentially take the award. First off, he plays at Missouri Class 6A powerhouse, Blue Springs High School. Secondly, his coach, Kelly Donahue, is as good as any in the metro at putting the ball in his playmakers hands (Kevin Zey, Darius Hill, and Carlos Anderson come to mind). And finally, Terry has committed to play at the University of Nebraska. This pledge of his will draw even more attention from locals, and his label as a "D1" player will attract quite a bit of attention on its own. Terry will definately have his opportunities to show his skills this season. With games against Rockhurst and Blue Springs South, it is almost a guarantee that he and Blue Springs will have many appearences on the Metro Sports, HyVee High School Game of the Week. Terry will get the pub he needs, it will just be a matter of him coming through and establishing himself as the most dominant receiver and defensive back in the city. 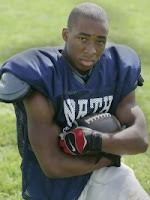 Franklin is the next big back in the storied history of Olathe North football. Will he live up to the levels of his predecessors who won the Simone (Arland Bruce '95, Darren Sproles '00, Maurice Mack '01, Jim Bouknight '02)? That seems to be one of the bigger questions flowing around the preseason talk of the Sunflower League. One thing that is intersting to note: Franklin was the only player on this list that was invited to the Simone ceremonies as a junior, meaning as a junior Franklin was in the top four of the Simone voting. What this tells me is that as long as Franklin produces like he did last season, he won't be losing any votes on the Simone campaign. He only has votes to gain in his senior season. After ending the 2008 season on a tear of 200 yard rushing games, it looks like Franklin will be back for blood again in 2009, as hungry as ever.